Watch the First Two TV Spots for the CG-Animated Film Ratchet and Clank! Gramercy Pictures has released the first two TV spots for the upcoming CG-animated film, Ratchet & Clank. This animated feature is based on the PlayStation game franchise from Sony and Insomniac Games. Synopsis: Two unlikely heroes struggle to stop a vile alien named Chairman Drek from destroying every planet in the Solana Galaxy. 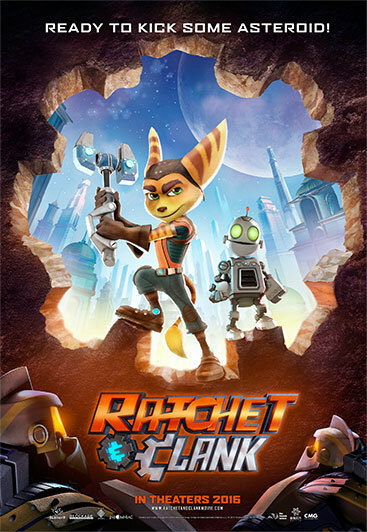 Ratchet is the last of his kind, a foolhardy “lombax” who has grown up alone on a backwater planet with no family of his own. Clank is a pint-sized robot with more brains than brawn. When the two stumble upon a dangerous weapon capable of destroying entire planets, they must join forces with a team of colorful heroes called The Galactic Rangers in order to save the galaxy. Along the way, they will learn about heroism, friendship, and the importance of discovering one’s own identity.